This NLP Business Practitioner course will give you a deep and broad understanding of the key skills and techniques of NLP and Coaching, which you will be able to use immediately in business and work, as well as other areas of your personal life. It is well accepted by organizations that the key to business success is through getting the best from its people. NLP and Business coaching has become an increasingly common way for organizations to help realize the potential of their workforce at all levels. 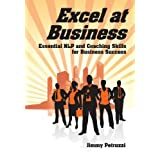 The NLP Business Practitioner covers a wide range NLP and Coaching techniques and strategies to help with business issues and concerns. The course is certified through the IANLPC - International Association of NLP Coaches. Study the full NLP Business Practitioner Course online, the online NLP Business Practitioner Course is exactly the same course syllabus as the residential course.